Picnic season is very much open. And venues might be grabbing at gimmicks to set their hampers apart from the masses, but the Berlin Picnic's German slant makes for a genuinely lovely USP. 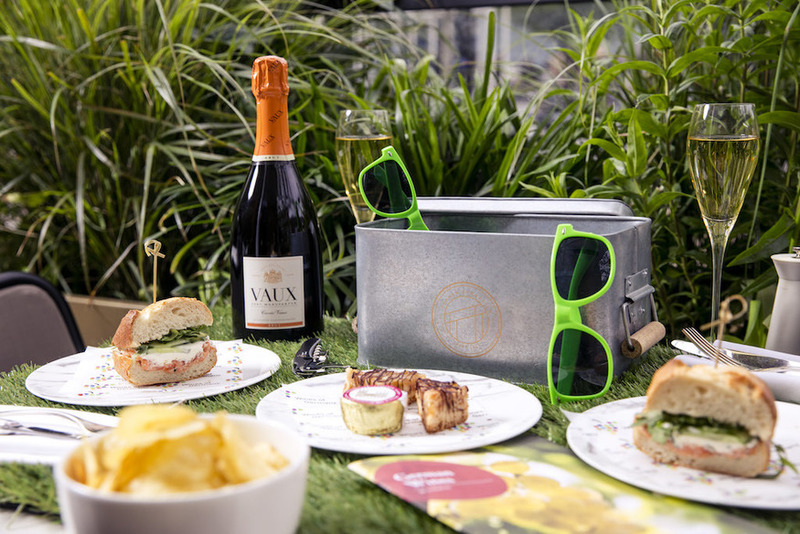 The steel hamper can be unpacked on one of the astroturf-covered tables on the German Gymnasium terrace, but has everything you'd need to take it further afield, including glasses, corkscrew... and two pairs of neon-green Wayfarer-style sunglasses. The sparkling bottle of Sekt in ours comes with Bavarian Giga rolls: thick, fluffy bread and rich fillings spilling out at the edges when you bite down. Crisps, marzipan and slabs of sticky Nussecken shortbread for dessert finish off a picnic that might be named after Berlin but comes with a Hapsburg-Empire level of grandeur. That doesn't come cheap — the hampers start at £65 — but nothing at German Gymnasium does. A pricey but thoroughly impressive way to get into the picnic spirit. The Berlin Picnic at German Gymnasium, King's Boulevard, King's Cross, N1C 4BU. Book ahead: available till 10 September.